Penne With Chicken | Simple and Delicious ! Whenever I cooked penne / pasta with chicken , it reminded me of kozhipidi.. Just add cooked pasta to your chicken curry to make a delicious dinner! Cook penne according to the instructions on package. Saute chopped onions until slightly brown. Saute the ground paste until the raw smell goes. Then add chopped tomatoes with all the powders and salt. Stir well and put the chicken pieces. Mix well adding little water enough to cook. Cook on a medium flame keeping the lid closed, stir occasionally. Add water only enough to cook. When it is done, put coriander leaves and cooked pasta. Mix well and allow to remain in the heat for few seconds. The pasta should be well coated with the sauce in the chicken curry. This is looking so good. Nice recipe. 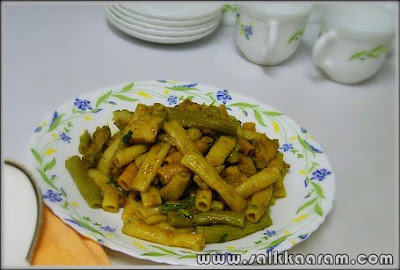 Loved to try some spicy pasta dishes like this....YUM! if the fotos displayed is your own u may personalize it by giving slightly visible [10 to 15% opacity] diagonal URL, so that nobody copy and reproduce your fotos. in case they do it that will be an advertisement too. in case case you dont understand what did i tell you, i shall send you a specime clip. 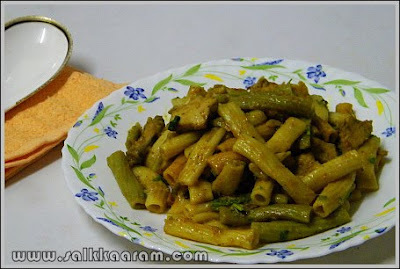 regarding this "penne with chicken" i could not understand well about the ingredients to my wife beena and she said to send the link to my daughter rakhi in kochi. and she will make it for us next week while we are there. in that case i shall make a print out of this particular dish and send to the "women's wing" of kumarasaan residential housing colony, cochin. than u so much seena for your wonderful presentation. A different and tasty recipe Seena! Looks delicious! !